The distal femoral epiphysis may fail before the medial collateral ligament. This differentiation between the physeal fracture and ligament tear can usually be made by physical examination. Avoid stress radiographs, as the study may further damage the physis. The instability may be demonstrated, but the diagnosis may be made by localizing the tenderness to the region of the physis of the knee. Fracture patterns The fracture patterns are variable. Most are SH-1 and SH-2. SH-3 fractures may be difficult to demonstrate without a notch view. Most femoral physeal fractures require anatomic internal fixation. Without fixation, displacement in the cast often occurs. For SH-2 types, fix the metaphyseal fragment with a transverse screw. Supplement with a long-leg cast. SH-1 fractures can be fixed with two smooth crossed pins. SH-2 fractures may require metaphyseal screw fixation, which avoids injury to the physis. Sometimes this is supplemented with a second screw or pin. Prognosis These physeal fractures are different from most physeal injuries. About half of these fractures develop physeal bars, causing deformity and shortening. Inform the family of this risk when first consulted. Follow carefully for signs of femoral shortening or changes in knee angle. Identify and resect small bridges early before significant deformity develops. Extensive bridges may cause serious shortening, requiring femoral lengthening or shortening procedures. This is a common site for pathologic fractures seen in neuromuscular disorders or following cast immobilization for management of conditions such as DDH. 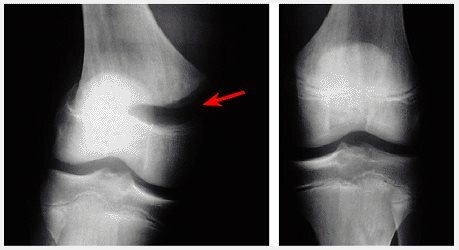 These fractures may occur from therapeutic manipulations of stiff knees. Manage most cases by splinting until pain subsides and by early mobilization to prevent further deossification. For displaced fractures, fix with long flexible IM rod(s) and mobilize early.